Two weeks ago, I got the opportunity to experience darshan of Mata Amritanandamay, better known as Amma. What started as a casual email invite, turned into a life fulfilling experience. Below, I have used my tweets to supplement my notes. A friend and I arrived at the event outside of Boston around 10:30 am. Tokens for the morning darshan were all gone and the evening program would start at 7 pm, with darshan sometime after 10 pm. I remained unfazed and chose to wait it out. We spent the morning wandering in awe at the 1000’s of devotees in near ecstasy. Then edged closer to where Amma was giving darshan (hugs). Despite the seeming chaos in the hall, there was a supernatural calm and everyone was utterly nice. Obviously, Amma’s radiance was infective. I saw how caringly Amma held each of her devotees, soothed the aches in their heart and lovingly embraced them. Most were in tears at this experience. Even from afar, I was not spared and felt a heavy burden lifted from my heart. I didn’t know what burden I had carried, but felt giddyly buoyant just being in her presence. Verily, in Amma’s presence, you are doused with love. Even though it was late, I didn’t want to leave Amma’s presence and offered to stay and help. Got a surprise call from one of Amma’s team, inviting me to join a few folks from our institution who were meeting with Amma on Tuesday. Unbeknownst to me, our hospital leadership had arranged a meeting with Amma offering collaborations with her organization. And I got invited. What a dramatically different experience! On Sunday I waited 12 hrs to get darshan. On Tuesday, our group of four were received at the door, whisked to the front where Amma hugged us and motioned for us to sit next to her. There in the midst of giving darshan, and through a translator, Amma laid out her challenges in providing healthcare to the 500,000 poor on the Lakshwadeep Islands and around Kerala. As we recommended various solutions, Amma impressed us with her astute knowledge of technological advances. Amma loved one of the projects I offered! After more than 30 minutes with Amma, we broke for lunch with her team and worked on logistics of our collaboration. Here is Amma singing Krishna Gopala Krishna from an older video. When she belts out “Krishnaaa Vasudevaaa,” we sense that Amma actually spies Krishna and calls out to him. And HE, pauses in the midst of attending to the Universe and smiles back at Amma (and possibly waves), leaving her with a beatific smile. By simply witnessing this casual exchange of devotee and God, our human eyes were blessed and a smile passed through our hearts. Our scriptures extoll that the divine is present in each and everyone of us. In us humans however, our ego veils our true nature forcing our association with the frailties of the human body. Exalted sages have come to realize that their bodies are mere vehicles to accomplish their duties in this world, and within their frames dwell the same being that powers this Universe. Amma is one of those who have broken the bonds of ego and reached self realization. 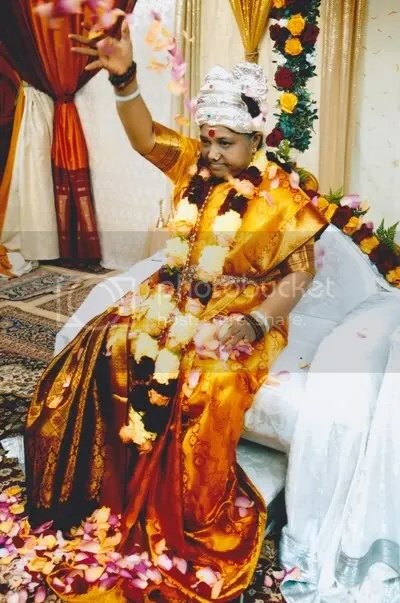 During Devi Bhava, Amma takes the form of the divine Devi (Goddess) to impress on us that the divine shines in everyone, and to give us each a peek at the divine manifested in human form, right here in our midst. Amma believes she is divine, only as much as she believes that we are all divine. In her talks she refers to our body as a “rented apartment” that we need to vacate when our duties on this earth are fulfilled. But for a brief moment, in her body, Amma reveals to us the dazzle of the Supreme, within everyone’s grasp. And her messages is crystal clear: Give of your self with love and compassion, and this too is within your reach. During the last night of the retreat, Amma in Devi Bhava. Extremely happy to hear your story of meeting Amma. beautiful story, dear Guru-bhai! Your joy is our joy! you might like to see our books about Her! and our music to Her! Thank you for your comment here and leading me to your web-site. I just posted about PRANAAM on my Facebook. Yes indeed. Pls do meet them as they will be really very happy to see you and your wonderful family. I will miss meeting you but then am sure we have lot of chances ahead!!! You are indeed a very blessed person, I had tears when I read your experience with Dear Amma, I had the opportunity to meet her too. Life is a bliss ever since!!! How awesome that you have gotten darshan of AMMA too. YES! I have been sooo blessed. Planning on taking Meera to see Amma in Amritapuri next month. and maybe be able to see Shubha in Mumbai. btw, I consider Shubha to be Meera’s sister. Thanks for sharing your tweets – what an experience! Thank you Preena. This was the first time I tried out this feature. A bit too gaudy, but prolly good for sharing a couple of tweets as a time. Wow! This is such a wonderful blog 🙂 Thanks so much for sharing and it sounds like an amazing experience!! hope your explorations with Amma’s grace are going well. Attended the Pepperell Satsang last evening. Bliss. Lovely pics.. you are very lucky Arun.. Did you get to listen to “Amma baramma” she sings it so beautifully and when she says Amma baramma it is so melodious.. This was my first experience and Amma’s singing is truly uplifting. 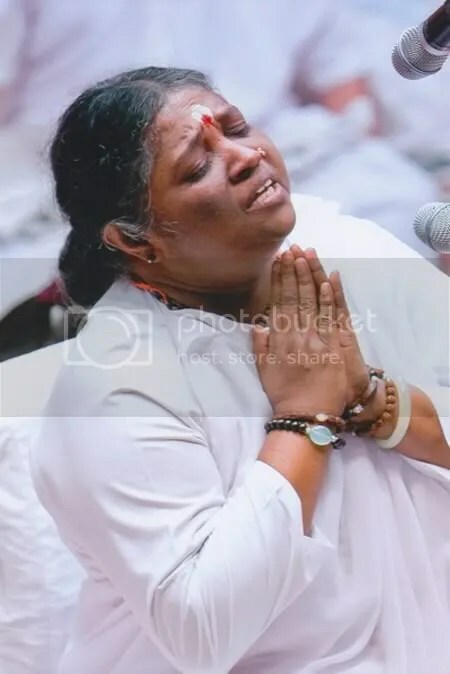 Did not hear her sing Amma Baramma, but just found it on YouTube. Awesome – thank you. Fabulous to hear that too have experienced her grace. Amazingly cool! You are very lucky. Yes, one of the coolest things I have done in a looooong time.